I recently acquired an F3- phase IV (or phase 4, if you prefer) shell that has a passenger pilot- in among several shells I picked up recently on eBay. However, so far, I have not come up with a reference showing what road(s) had F3s with passenger pilots. Does anyone have a list, or point me in the right direction? Googling has provided links to the original auction, lots of photos of F3s with freight pilots, and such "useful" info as that they were made by EMD and 1500HP and LOTS of hobby shops that sell Kato, Athearn, Intermountain etc, etc, etc. (the internet was so much more efficient in the old days). Any help in locating prototype info on these would be greatly appreciated. Edit to add a couple notes- the shell is N scale by Marc's Custom Models. I am aware of the Kato CBQ shells of a couple years ago with passenger pilots, this is NOT that version of the F3. This one is a late model (phase 4) - with grills and louvers and low fans like an F7, but dynamic brake slots (rather than a fan) that distinguish it as an F3. Not answering your question, but Wabash F7s had passenger pilots (two were apparently rebuilt after wrecks with freight pilots). 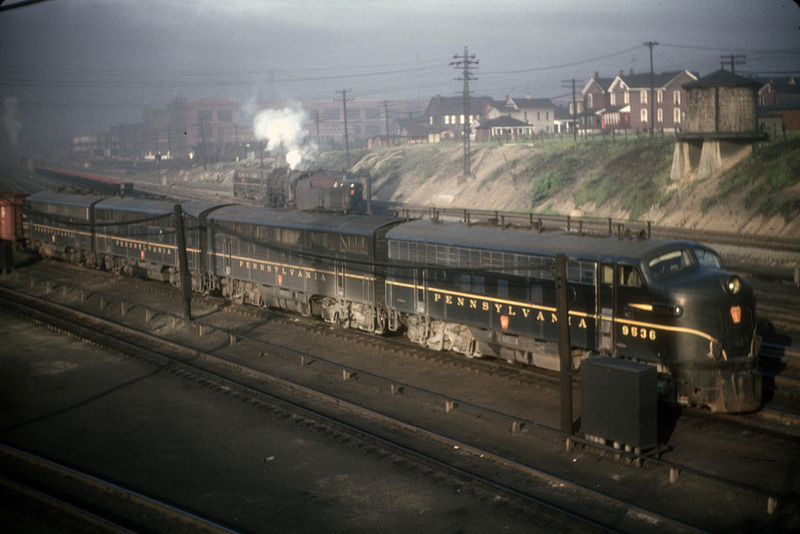 It looks like the 7 AB sets of F3s that the B&O acquired in 1949 for passenger service (gear ratio 57:20) originally had passenger pilots (based on pictures and drawings I can find in books). The A units were numbered 82, 82a, 84, 84a, 86, 86a and 88. There were an equal number of B units, numbered like the As but followed with an "x". Supposedly, they were to be operated as ABB or ABA sets on the "Columbian" and the "Ambassador" trains on the Chicago runs. But, many pictures show only AB sets or sometimes AB sets of these F3s combined with an E7 A or an E6 B. The "a" suffix units could be renumbered to the next higher odd number when separated from their usual partners. Then the B&O renumbered everything in 1957, giving all diesels unique 4-digit numbers, so no more a or x suffixes. Later (1960s) pictures show these units with freight pilots, so it is not clear to me whether the freight pilots came slightly before or slightly after the renumbering. You will need to ask a B&ORRHS expert for that type of detailed info.